You must know the weight of what you intend to lift and choose a ram with at least 20% more capacity. Be aware of possible load shift requiring more capacity at any particular lifting point. your hydraulic system. Do not use damaged or worn components. Turn them in for repair or replacement. Read all warning labels and instructions. Operating instructions must be understood before using equipment. Never remove labels from equipment. Replace missing, worn or damaged labels. Always wear safety goggles and protective clothing when using hydraulic equipment. 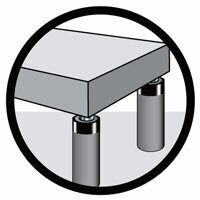 Every jack or ram, whether used individually or in a system, should be completely supported on a solid, firm, non-sliding foundation capable of supporting the load. Only fill pump to recommended level; only fill when connected cylinder is fully retracted. 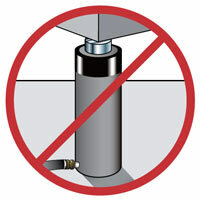 Do not use extensions or cheater bars on hydraulic jacks or hand pumps to raise a load. The load must be centered on the ram, or equally distributed on multiple rams. Off-center loading can result in the ram slipping out and loss of the load. For multiple ram lifts, you must be able to determine the location and number of lifting points that will allow the load to be evenly distributed to all the rams. This is called load balance. Size, center of gravity and load geometry must be considered in order to correctly determine load balance. Place blocking or cribbing under the load as you raise it. Each time you raise it higher, insert more blocking. Position yourself in a manner that will keep you clear of the load, and will not allow your hands or other body parts between the load and the cribbing. 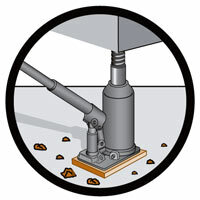 Hydraulic rams are not meant to be used as permanent supports, but are designed to lift and lower. 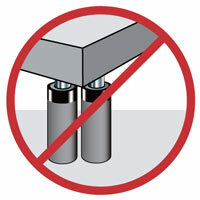 If you need to hold the load for any length of time, cribbing or Simplex locknut cylinders should be used. When making connections with quick couplers, make sure the couplings are fully engaged. 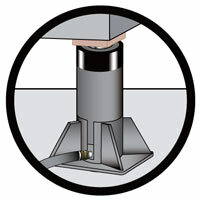 Threaded connections, such as fittings, gauges, etc., must be securely tightened and leak free. Never use excessive tightening force that may distort the fittings or strip the thread profile. Weld splatter will damage plunger rods and hoses. Hydraulic fluid can ignite if vaporized or exposed to high temperatures. 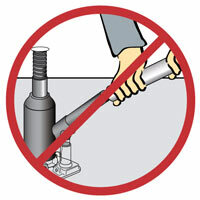 Never attempt to disconnect hydraulic hoses, fittings or couplers under pressure. 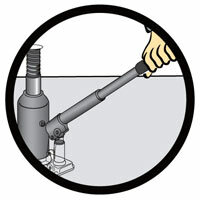 Unload the ram, open the release screw on the hand pump and shift or open all hydraulic controls several times. If system includes a gauge, double check the gauge to ensure pressure has been completely released. Dragging or carrying rams or pumps by a connected hose can damage the couplers and hoses. Using damaged couplers and hoses can be dangerous. Do not drop sharp or heavy objects on hose. Keep hose out of heavy traffic areas. Avoid internal damage to hose wire strands. Applying pressure to a damaged hose may cause it to rupture. 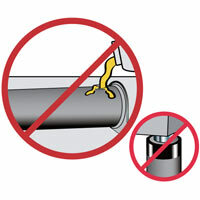 Avoid sharp bends and kinks when routing hydraulic hoses.